A powerhouse of a purse makes its way to the front of the fashion line. The not-so-latest fashion-tech, geek-chic craze is all about accessories. USB ports take out the terror of "one size fits all" labels by switching you from charging credit cards to charging gadgets. Though not actually Prada, it may not be too long before high fashion predicts green for next year's color. 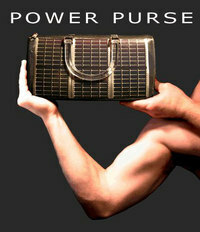 The Solarjo Power Purse (not sure if we should forgive the awful web design and photography for a good cause? - but c'mon, this has been out since 2005) will run you less than $300, but it'll be worth every penny to turn your nose up to your leather-bound, car-less friends as you pop into your hybrid SUV.